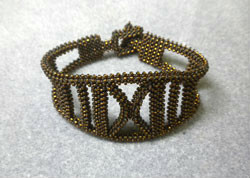 Copper lined Toho beads are woven into this double wide cuff bracelet. The clasp is a 14k gold filled magnetic slide. 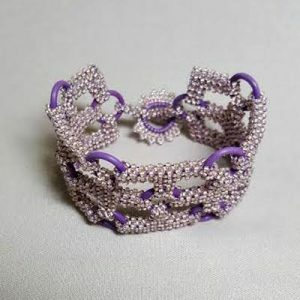 This bracelet is designed to be worn as a cuff. Made by Karen Kubby. 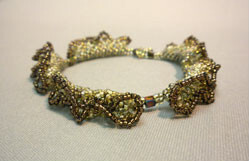 Two sizes of Toho seed beads are woven into netted structures. This bracelet is light on weight and heavy on elegance. Made by Karen Kubby. 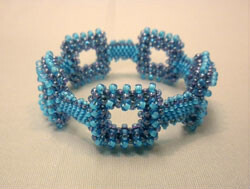 This new design by Beadology Iowa co-owner Karen Kubby is a negative space bracelet using three seed bead weaving stitches and two embellishment techniques. Please call for other colors available. These bracelets can be custom ordered to get the size and colors you want. Add 15% for custom orders which must be placed over the phone or in person. Inside diameter on this piece is 6.75″. 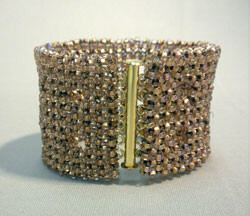 This cuff is made from tiny Czech seed beads woven with cubed right angle weave. Even the clasp is beaded. Made by Beadology Iowa co-owner Karen Kubby. Custom orders welcome. Add 15% for custom orders which must be placed over the phone or in person. Cubed right angle weave is used with Toho beads to create this fun and unusual negative space bracelet with a 14K gold filled magnetic slide clasp. One of a kind piece made by Karen Kubby.